Up to 20th century simple inorganic poisons and plant-derived compounds including pyrethrum were used for the control of insect pests both of plants, animals and humans. After World War II these were largely substituted by dichlorodiphenyl-trichloroethane (DDT), organochlorines, organophosphates and carbamates which were distributed worldwide in large quantities. Many of these have shown a disadvantage either in toxicity to non-target organisms, or by persistence in the environment, resulting in bans of these pesticides in many countries. Cycloprothrin, invented by CSIRO’s George Holan, had a different origin. It resulted from a long, rational, multidisciplinary search for nontoxic insecticides, using studies of the architecture of insecticide structures and their effects on the physiology of insects. Holan predicted DDT-like insecticidal activity for certain small ‘molecular wedges’ that had a specific fit into the nervous system of insects but not that of mammals. He then turned to the structure of the natural pyrethrum insecticide molecule and formed a hybrid DDT-like-pyrethrum structure with high insecticidal activity. Its DDT-like part offered stability, while the pyrethrin portion offered greater potency and enhanced biodegradability. Cycloprothrin, one of many such structures synthesised by Holan and his colleagues, is one of the safest pesticides ever developed. In rice culture it was specifically active against major rice pests. Of greatest significance was the new insecticide’s low toxicity ‘ both to mammals and to fish as the latter is an important food staple grown in flooded rice paddies in Asia. In 1978, the Japanese chemical company Nippon Kayaku signed an agreement with CSIRO for the commercial development of Cycloprothrin. After its registration in Japan and other Asian countries a purpose built, multi-tonne/day chemical plant at Kashima in Japan, started operating in 1982 and to date manufactures the formulated compound for the rice-growers in most of Asia. CSIRO has collected tens of millions of dollars in royalties from the many patents filed on these inventions. For the control of insect pests of plants, animals and humans up to 20th century there existed the simple inorganic poisons like lead arsenate and later, the more complex plant-derived compounds such as nicotine, derris dust, and pyrethrum. After World War II there appeared the first of the modern series of insecticides, DDT and the associated organochlorines. These were followed by the organophosphates (originally modified from chemical warfare agents) and the carbamates. These pesticides, with the exception of the organochlorine compounds including DDT, are still used to this day for the control of plant, animal and human insect pests. Cycloprothrin is remarkable because it was developed from first principles; this makes it the first ‘designer’ insecticide. The common insecticides were first identified by random screening for insecticidal activity (DDT was first synthesised in a program to develop a new dye) or are derivatives, or analogues of compounds with known insecticidal activity. The pyrethroids offer the best example of what is called analogue development from the chrysanthemum extracted pyrethrum. However Cycloprothrin invented by George Holan has a different and long history. This started back in 1958 when Holan, in attempts to develop nontoxic insecticides at Monsanto Company (USA and Australia) began a study of the mode of action of DDT. He continued this approach on joining the CSIRO Division of Applied Organic Chemistry in 1967. Despite its widespread use worldwide, over the preceding 20 years, there still was no satisfactory explanation for DDT’s efficacy and mode of action. In addition, most nations were banning the use of this important insecticide because of the persistence in nature of its breakdown product. To develop a theory of action Holan began to synthesise a range of compounds related to DDT and established, with the help of CSIRO, a biological laboratory located at the University of New South Wales. There Chris Virgona tested the toxicity of these compounds against standard strains of the housefly and mosquito. He also tested their toxicity in fish and mammals using single nerve preparations. 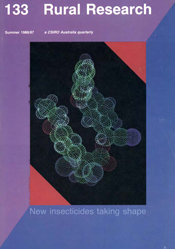 By calculating the size of the various molecular structural components of the DDT-like molecules, Holan found he could relate the compounds’ molecular architecture to their insecticidal activity, correlating their X-ray determined structure with their neurobiological effects measured in single insect nerve cells. Holan postulated that for a compound to have DDT-like insecticidal activity it was essential that molecules possessed a wedge shape. Such molecules would lock themselves into insect nerve membranes with their broad base while the apex of the molecular wedge kept open a nerve membrane structure. In all nerve transmissions sodium and potassium ions are required for nerve propagation along the nerve fibre. Unfortunately for the insect, the sodium look-alike apex of the wedge of the insecticide doesn’t pass through but locks itself in the ‘sodium gate’ and acts to keep the sodium ion channel open. The effect is a continuous influx of sodium ions, forcing the nerve to keep firing until exhaustion and eventual death prevent it from firing any more. This is observed in the characteristic rapid spasms of affected insects. In mammals including humans this action does not take place because the nerve architecture is different. George Holan concluded that provided a chemical has three essential features ‘ a wedge shape, a base with enough electrostatic attraction for the overlaying nerve membrane protein, and an apex with an end-on diameter of about 0.6 nanometres ‘ there is a very good chance that it will have DDT-like insecticidal properties. With this knowledge it became possible to synthesise a vast array of chemicals with a shape similar to the DDT molecule. These compounds, called isosteres, can act against DDT-resistant insects that depend on the activity of an enzyme to destroy the DDT’s apex. Provided this part is replaced by a molecular arrangement of comparable size, the insect nerve system is ‘tricked’ and it will succumb to the new chemical. Of course not every new chemical that fulfills the basic requirements will prove to be an effective replacement for DDT. Apart from its efficacy, major considerations included the difficulty of a particular synthesis, its transport to the site of action, mammalian toxicity, etc. One compound that showed early promise, called GH74, had a slightly modified base and did not contain chlorine. With activity equivalent to DDT, low toxicity, and a structure that would not pose the residual problems that were emerging with DDT, it appeared set to enter commercial development by Wellcome Co. in the UK who expended £1.2 million in its development worldwide. Unfortunately, the sudden onset of the 1974 energy crisis pushed the cost of the petrochemicals necessary for its synthesis to uneconomic levels and development had to be aborted. Around this time synthetic pyrethrins were being studied in England. These were derived from the natural product insecticide ‘ pyrethrum ‘ extracted from a species of chrysanthemums grown on a large scale in Kenya and already known for this insecticide effect since the 19th century. The new studies were prompted by the instability and variable activity of the natural product. Holan noted that an essential part of pyrethrum structure was a small triangular cyclopropane ring, very unusual in natural products and that its structure fitted the small wedge shape required in his own DDT analogue insecticide structures. He duplicated this in a new compound that replaced the wedge structure for the trichloromethyl group of DDT with a dichlorocyclopropane. This compound was shown to be a new highly active general insecticide. Holan’s suggestion that the similarity implied a similar mode of action was the subject of some dispute, and to investigate this connection Holan, together with David O’Keefe and Reimund Walser, began a long series of syntheses of DDT-isosteres featuring the cyclopropane and other small rings. Nearly all the resulting compounds had insecticidal activity and their effects on single, isolated insect nerves were studied by the biologist in the group, Chris Virgona. It was then that Holan argued that, since they had a DDT-isostere with the biological properties of the pyrethrins, why not combine parts of the DDT-isostere and the pyrethin molecules? The DDT-isostere offered stability, while the pyrethrin portion offered greater potency and enhanced biodegradability. This was due to the linkage of the two halves of the new molecule with a ‘breakable ester’ structure resulting in ready biodegradability and lack of animal and fish toxicity. This gave these new structures an advantage over the bio-stable and eco-persistent DDT and many other non-degradable insecticides. One of the more than 400 compounds designed by this scheme was later marked for development and registered with the generic name of ‘Cycloprothrin’. Of great significance was the new insecticide’s low toxicity ‘ both to mammals and to fish. Toxicity studies have confirmed that Cycloprothrin is one of the safest pesticides ever developed. Indeed, acute toxicity tests have run into major difficulties with the registering authorities in not being able to introduce enough of the chemical into test animals to produce any toxic effects. The fact that fish are not susceptible is particularly important, as a major constraint on the use of pesticides in Asian flooded rice-fields is the death of fish following the application of organophosphate, carbamate, or pyrethrin insecticides. Since fresh-water fish (killifish, loach) are nearly as significant in the diet as rice itself, Cycloprothrin is ideally suited to and has an effective role in rice cultivation in all of Asia. In rice culture it is specifically active against major rice pests such as the green paddy-hopper and the rice stem-borer. The Japanese chemical company Nippon Kayaku signed an agreement with CSIRO for the commercial development of Cycloprothrin in 1978. By 1982, after registration in Japan, they built a mostly automated chemical factory at Kashima, specifically for the synthesis and formulation of Cycloprothrin on a 4 ton/day production (it is known in Japan as Cyclosal or as formulation U-2). The main markets for the chemical are Asian rice-growers in Japan, Taiwan, Burma, Vietnam, Indonesia, Thailand and China. CSIRO collected tens of millions of dollars in royalties during the run of the many patents that George Holan filed on the inventions. The demonstrable success of Mr Holan in designing the new insecticides encouraged CSIRO to take a more active interest in the commercial development of agrichemicals. The Division of Applied Organic Chemistry and its successor the Division of Chemicals and Polymers formed an agrichemical research company called Dunlena with the Dupont Company in the USA. Scientifically, Holan had shown that the method of screening of tens of thousands of compounds to find a few biologically active candidates, could be replaced by a rational approach. This involves many disciplines such as neurobiology, biochemistry, toxicology, etc. The main aim of this approach is not manipulation of organic chemical structures but an understanding of the physiological function of each part of an active molecule. He later extended this philosophy, to the rational synthesis of drugs in the CSIRO/Biomolecular Research Institute partnership. There he developed the science of polyvalent structures called dendrimers to form new antiviral drugs against HIV, Herpes, Hepatitis B, Cytomegalovirus, etc. This resulted in the formation of the company Starpharma that is currently developing one of his anti-HIV structures as a prophylactic (Viva-Gel) against HIV and Herpes infections.